Distinctive Features: Medium-sized to large; smooth, shiny scales; wide head and neck; wide black band on underside of neck; distinctive hood marking on top of neck. Description: The Spectacled Cobra is a smooth-scaled snake with black eyes, wide neck and head and medium body. Colouring varies form black or dark brown to yellowish white. The underside is usually white or yellowish with a wide dark neck band. The body is generally covered with a speckled white or yellow pattern, sometimes forming ragged bands. The famous hood marking of the classic design, shows a connected pair of rings. Occasionally, it may not even resemble spectacles, or may be altogether absent. The cobras of northwest India are blackish and have a barely distinguishable hood marking. Cobras are often confused with the Indian rat snakes, which have a much thinner neck and head, and become 3 metres long, a metre more than do the biggest Indian cobras. The Spectacled Cobra is the most widely distributed of the generally accepted 3 sub -species of cobras in Indian and is one of the big four dangerous snakes, 6 species of cobras occur in Asia and 9 in Africa. The jet black cobras occur in Asia and 9 in Africa. The jet black cobra of northwest India and Pakistan is another sub-species or geographic race. 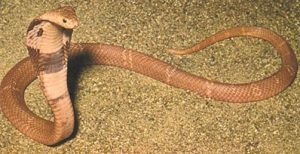 Except for its colour and absence of hood marking, it is very similar to the spectacled Cobra. Distinctive Features: Large; smooth, shiny scales; distinct light cross bands mainly on the forebody; large head scales edges with black. Description: The large head of the giant King Cobra is little wider than the neck. The head scales are edged with black and the overall colour varies from yellowish to deep olive-green but the tail if often jet-black. The underside is a lighter shade of the body colour. 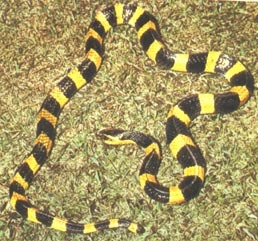 The yellow bands on the snake’s back are more obvious in the light coloured specimens from Orissa and Uttar Pradesh. King Cobras are the largest venomous snakes in the world. Distribution: Rare in India, King Cobras are confined mostly to the dense forests of the Western Ghats and the northern hill forests. Nilgiris, Plains and Western Ghats upto Goa, the Himalayan foot hills (upto 2000 m) starting near Lahore in Pakistan through North Indian to Assam. Forests of Orissa, Bihar, West Bengal and the Andamans. Distinctive Features: Medium-sized to large; smooth, shiny scales: wide bright yellow and black bands on back. Description: The Banded Krait is a large, conspicuous yellow and black banded snake with a prominent backbone, blunt tail and rounded head slightly distinct from the body. The bands are faded on the underside. Distribution: Assam, Bengal, Bihar, Orissa and reported in parts of Madhya Pradesh, Andhra Pradesh and Uttar Pradesh. Found upto 1500 m above sea level. Distinctive Features: small, slender; smooth, shiny scales: blunt, black head; tail black, scarlet and blue. Description: The Slender Coral Snake is light brown and family speckled. The head and neck are black with two conspicuous yellow spots on the top of the head. There is a ragged black ring at the tail-base and at the tail-up. The underside is uniform pinkish-red (coral), bright scarlet at vent, and the underside of the tail is bluish. The head is blunt and has the same width as the neck; the scales are smooth and slightly glossy. Slender Coral Snakes are one of the 5 Indian coral snakes. The other 4 are hill forest species of the Western Ghats and eastern Himalayas. Distribution: Reported from the most parts of India on the plains, except central and northwestern India. MacClelland’s Coral Snake is found up to 4000 m in the Himalayas. Distinctive Features: Medium-sized; smooth, shiny scales; wide head and neck; distinctive hood marking different from that of the spectacled cobra. 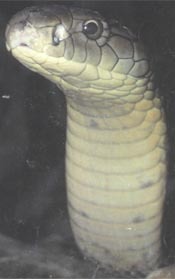 Description: The skin of the Monocled Cobra is shinier, the hood rounder and smaller and the head smaller than is that of the spectacled cobra. The colour varies widely, from yellowish to greenish brown to black, with ragged bands. There is a conspicuous white monocle on the hood. 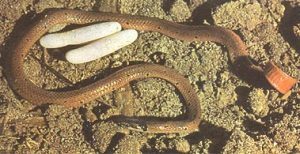 The underside is yellowish white Monocled Cobras superficially resemble Spectacled Cobras, but there are many small differences. Distribution: Monocled Cobras are a sub-species most commonly found in northwest India, parts of Uttar Pradesh, Bihar, Orissa and the Andamans, all of Bengal and Assam. Distinctive Features: Medium-sized to large; strongly keeled scales; distinctive bright chain pattern; large triangular head. Description: Russells Vipers are heavy, rough-scaled snakes with vertical eye pupils and generally a very bright pattern. The body colour is usually brown or yellowish and the pattern is composed of dark, round spots edged with white and black. The underside is white in the western, partly speckled in the southeastern and heavily speckled in the northeastern race. Colour variation is common, and the best recognition characters are the short, fat body, the triangular-shaped head and very regular chain like pattern. Russells vipers resemble the fat, harmless common sand boas which however have shorter and blunter tails and irregular body patterns. The bright symmetrical spots on Russells Viper’s backs make them easy to differentiate. Russells Vipers are one of the big Four dangerous snakes of India. The other large Indian viper is the Levantine Viper, a heavy brown snake found in parts of Kashmir which grows to 11/2 m.
Distribution: Hills and plains throughout India upto 3,000 m.
Distinctive Features: small; strongly keeled scales; head wider than neck; dull colour; cross mark on top f head distinctive. Description: A rough scaled snake with large eyes, wider head than neck and stocky body. The scales are heavily keeled. The body is brown, grayish or sandy with a darker zigzag pattern on the back and a distinct cross or lance mark on the head. The underside is white with brown speckles. The tail is short and stubby. Saw-scaled Vipers are the smallest of the Big Four venomous snakes and are less of the threat to man in South India because of the small size of the southern type. The northern for, however, grows large enough to be a potentially dangerous member of the Big four. Distribution: Throughout India, mostly on the plains. In northwest India, Saw-scaled Vipers are reported from upto 2000m ion the hills. They are plentiful in certain area such as Ratnagiri District in Maharashtra, parts of Punjab, Rajasthan, Tamil Nadir and Andhra Pradesh. Distinctive Features: Medium-sized; smooth, glossy scales; head slightly wider than neck: jet-black, usually with distinct white cross lines. Description: Common Kraits are smooth, glossy bluish-black snakes with the rounded head slightly distinct from the neck. The body colour varies from a dark steely blue-black in a specimen which has freshly shed its skin to a pale faded bluish grey in one just about to shed. There are normally about 40 thin white cross bands. The young and some adults may have white spots along the first third of the backbone in place of the cross lines. This variation as well as uniform black variants appear in certain geographic races. The underside is white. Common Kraits are often confused with wolf snakes (Lycodon sp.) which are much smaller, with flat, somewhat pointed heads. The Common Krait is the best known of the 6 Krait species found in India and one of the big Four dangerous snakes. Besides the Common and Banded Krait, the other krait are rare and confined to the eastern Himalayas and Assam.